Hey Content Marketing! Say Hello to Print Catalogs! These days content marketing is just about the hottest topic around. And for good reason — it really works! If you create relevant and useful content for your industry, you will attract and engage your target market. It will become a crucial competitive advantage that pays dividends year after year. The rationale that is usually given for publishing quality content is to improve your standing with the search engines. Google knows that if people are staying on your site for a while, that probably means they found some useful content. But improved ranking is not the most awesome thing about content marketing. The really big win from content marketing is that it creates goodwill, loyalty, respect, and gratitude. You will earn kudos from customers, prospects, partners, and industry influencers. All of these people appreciate your giving them information that will help them in their work. And the more good content you offer, the more it will help your reputation and the success of your business. So how do you get this content into the hands of the people that matter? And how do you leverage that content to accomplish the all-important task of educating those same people about the products and services that you offer? You already know the standard answers: blogs, ebooks, and whitepapers. Those are important, no doubt about it. But they are all flawed in the same way: They can vanish from the screen in a second. One random click and you've lost them. You're lucky if they spend two minutes with your content. This is a crime. Good content is timeless. Your work can be wasted for the most trivial of interruptions. And even worse, there's not much chance that they they will even see your product information. So how about taking that excellent content and including it in your print catalogs — especially niche catalogs? Now you have delivered your valuable content in a way that is convenient, friendly, and more powerful than any web page could possibly be. You have given the reader something they can read on the train, hand to a colleague or friend, and refer to again and again. The publication is essentially a micro trade publication, branded by you. It features the product mix and the articles that you have selected as best for that niche. Can you think of a better way to make a positive and lasting impression? Now take it one step further. 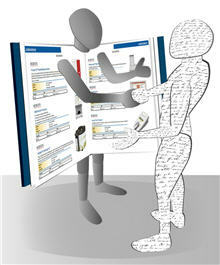 Give each of your sales reps and dealers the ability to create customer-specific catalogs. No one knows the customer better than they do. They get their logo and contact info on the cover, and have the ability to cherry pick the products and articles. By making it super-simple to create catalogs, you can leverage both your excellent content and your dealer's inside knowledge far more than would otherwise be possible. Does this strategy sound like a good idea for your business? If so, let us know! Let's get in touch and discuss your requirements.